Place the bananas in the food processor and pulse/blend until smooth and creamy. Stir in ½ cup mini chocolate chips. Grease a mini muffin pan with non-stick cooking spray. Scoop the banana ice cream into each cup, filling each one almost full, then sprinkle the top of each cup with a few more mini chocolate chips. Place the muffin pan in the freezer for an hour. Remove the pan from the freezer and pop each bite out with a knife. 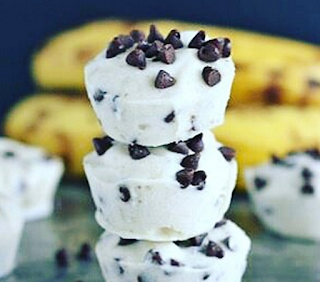 Stack the banana ice cream bites in a freezer safe container with a lid, placing parchment paper between each layer of bites to keep them from sticking together. When ready to eat, remove however many bites you want from the freezer container and let set out for a few minutes before eating.